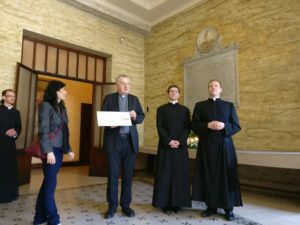 On Sunday 22nd April, the College community presented the proceeds of our Lenten Charity Collection to Ms Francesca Piana on behalf of Lasallian World Projects, the charity chosen by the College community this year. The total amount raised was €3,400. This was achieved in a number of ways: contributions from all residents of the College, from the Sunday congregation, through raffles at the St Patrick’s Day celebrations, and through our “Fasting Friday” initiative throughout Lent. This proceeds will go towards the building of a new secondary school in India. More information can be found here.